Downtown Puerto Vallarta which is also referred to as Centro is located just south of the Hotel Zone and north of the Rio Cuale. Downtown Puerto Vallarta is the living, beating heart of Puerto Vallarta and this is where much of the city’s action takes place. The entire area is filled with lovely Colonial-era buildings with red-tiled roofs. Many buildings are painted in bright colors with their walls and terraces often punctuated by vines such as bright pink buganvilia and other green foliage. Visitors are encouraged to take long and pleasurable exploratory walks down the narrow cobblestone streets to discover uncountable local treats at every turn. There are an abundance of restaurants, bars, and interesting stores, the style, color and vibe of which cannot be found anywhere else in the world. For a great visual of the area, refer to the printable map of Centro / Downtown. And no visit to Puerto Vallarta would be complete without a leisurely stroll along the Malecon, the stunningly beautiful beachfront boardwalk which gracefully traces the edges of beach and ocean, and was newly renovated in 2011. Of great interest are the numerous bronze statues that are erected at various places all the way down this mile-long stretch. Caballero Del Mar, a bronze statue of a little cowboy riding a seahorse is a world-famous symbol of Puerto Vallarta. Along the ocean side of the Malecon visitors are afforded spectacular panoramic views of beautiful Banderas Bay. 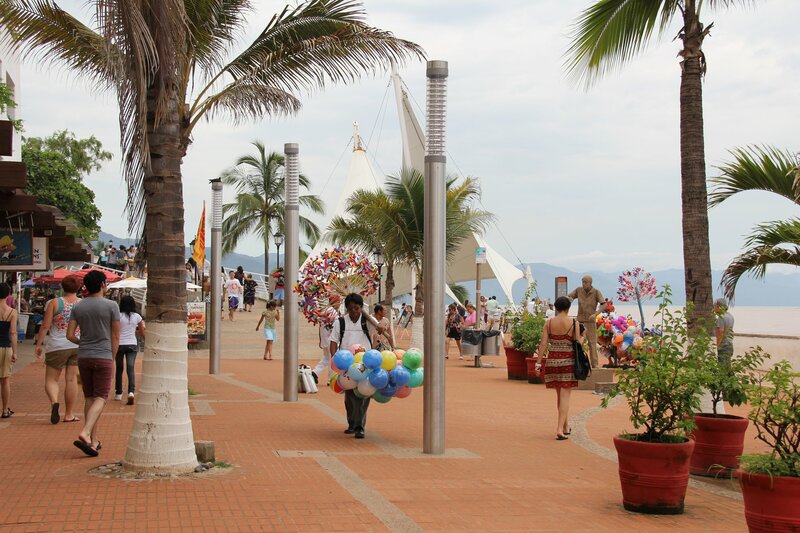 The inland side of the Malecon is lined from end to end with numerous restaurants, bars, small eateries, cute boutiques and other shops with colorful and eclectic offerings. There are several art galleries with amazing selections of truly unique pieces. An additional shopping venue along the Malecon is the cute and vibrant little flea market whose small entrance is marked with the sign: Plaza Malecon. A small metal seahorse fronts a rod-iron image of the sun above the open-gated entry to the flea market. A colorful wall mural depicting an ocean scene greets visitors as they enter the passageway to this hidden gem. Another way to find Plaza Malecon is to look for it between the streets Allende and 31 de Octobre. At night the Puerto Vallarta Malecon takes on a completely different personality than it has during the day time. In the evening the boardwalk is truly a feast for the senses. Lively and festive multi-colored lights emanate outward from a strip of open-air nightclubs playing popular tunes with music videos flashing on big screens. Sparkly lights bounce off mirrored balls hanging from the ceilings while young adults dance and laugh, while every now and then a 20-something glides through the air on a huge swing set up at the entrance of one of the nightclubs. Vendors up and down the Malecon display an array of light-up toys and cotton candy. As the sun falls low, visitors can enjoy a variety of live music at several area restaurants and bars. Most evenings there is usually an opportunity to view free entertainment at the Los Arcos outdoor amphitheater located behind iconic seafront arches, and across from the Main Plaza. Throughout the year there are many cultural offerings and performances based on the season. A favorite of local families and visitors alike are the street food vendors that are lined up just south of the arches and the Naval History Museum (Museo Historico Naval) selling grilled corn on the cob, French fries, tamales, crepes, nuts, candies and so much more. To walk the Malecon at night is to experience the refreshing, eclectic and vibrant feel of gorgeous Puerto Vallarta, Mexico. 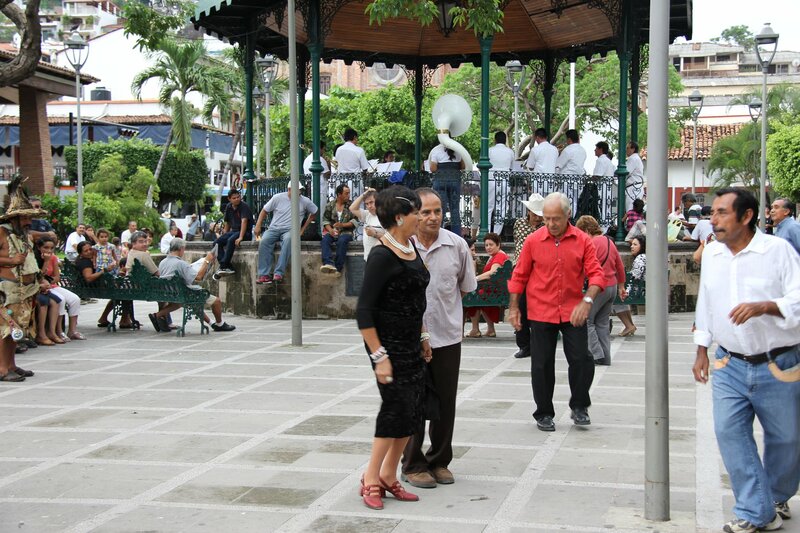 An important landmark of Centro is the Main Plaza where locals and visitors alike enjoy hanging out to mingle and socialize. Vendors selling balloons, spinning pinwheels, cotton candy and toys for children are a staple in this area. A real treat is when Concepcion, wearing a white shirt and white pants, comes by the Main Square to sell his delicious Tuba Water which he carries in a clay vessel. 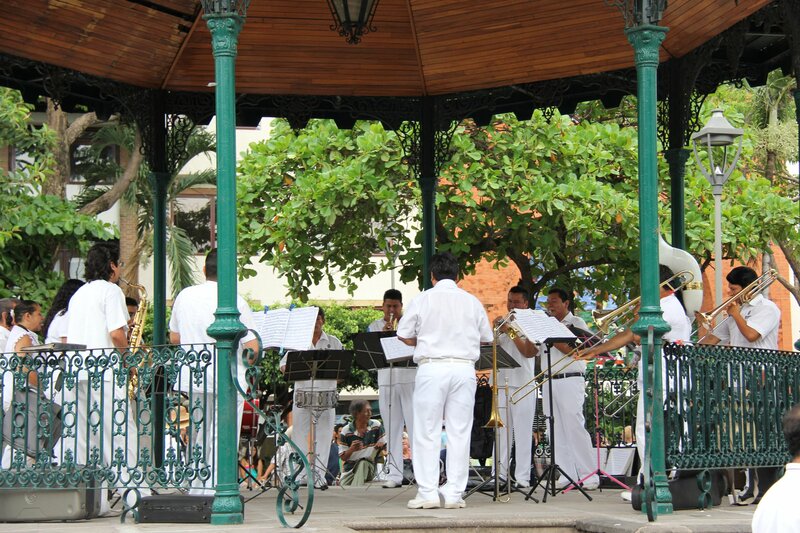 In Puerto Vallarta special events occur in the the Main Plaza on Thursday evenings at 6 p.m. when a municipal band plays for an appreciative crowd, and on Sunday evenings at 6 p.m. when ballroom-type music is played by a full band that is situated within the raised center gazebo or bandstand area. During these times some people gather with family and friends to relax and enjoy the delightful music and ambiance while others who are swayed by the rhythm feel moved to get up and dance. 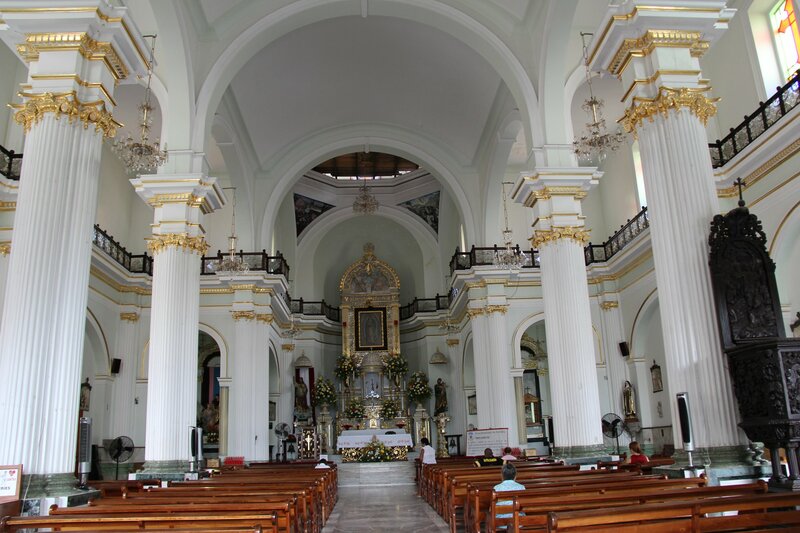 Across from the Main Plaza is the beautiful Church of Our Lady of Guadalupe. 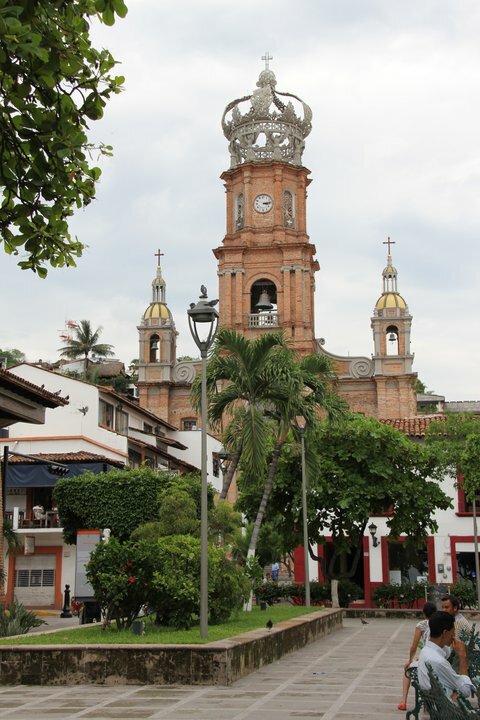 The enormous ornate crown that sits atop this church is probably the most recognizable icon of Puerto Vallarta. The original crown constructed of cement crumbled during an earthquake in 1995, and it was necessary to install a temporary crown made of fiberglass until a new permanent crown could be constructed. Finally, in 2009 a beautiful new crown was completed, blessed, and erected during a special ceremony. 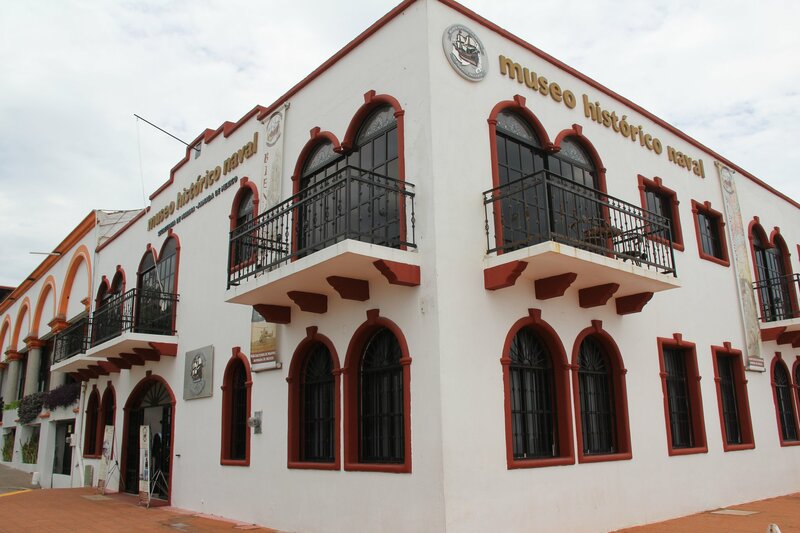 Its new design incorporates many symbolic elements important to the city of Puerto Vallarta. Visitors who find an opportunity to view the interior of this church will be humbled by the amazingly beautiful architecture of the building. The south end of Centro is bordered by the Rio Cuale, a river that as it nears the ocean branches into two sections around a tiny island (Isla Rio Cuale) which is directly in the middle. In this manner, the Rio Cuale effectively divides the downtown area into two distinct parts: Centro or “Downtown” to the north, and the Romantic Zone which is also referred to as “The South Side” or “Colonia Emiliano Zapata” to the south. Where the mouth of the river opens to the ocean visitors will notice that many local families enjoy relaxing and swimming in this area beneath the pedestrian bridge.